Keto Carbonara - Headbanger's Kitchen - Keto All The Way! I love me a good Carbonara. It’s one of the simplest and most tasty Italian dishes. 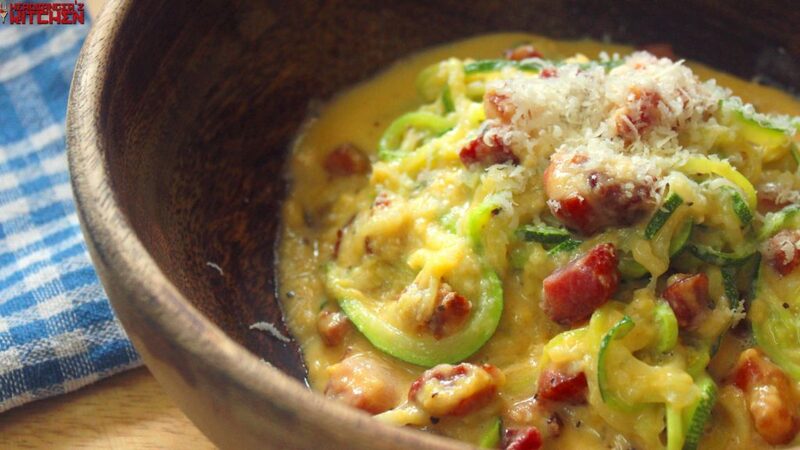 Of course a Keto version would replace the spaghetti with Zucchini noodles/spaghetti. Everything else remains the same. The trifecta of cheese, bacon and eggs. Good quality ingredients make the best Carbonara. Just remember there is no cream in Carbonara. I took inspiration from the late Antonia Carluccio for this recipe. I’ve always loved his demeanor, presentation and simplicity when it comes to cooking and teaching us the art of true Italian cooking. I realized I do a lot of Italian recipes. I’m not sure if it’s because they just seem to lend themselves so well to the lifestyle and are easily adaptable or maybe I just love Italian food? I think it all started somewhere with my love for Tiramisu (I’ve made a Keto Tiramisu) . It might also have something to do with the fact that pasta has kind of been a staple in my house while growing up as well. 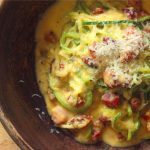 One of my first Keto recipes was with Zucchini spaghetti where I made Keto Alfredo Fettuccine and Pesto Zucchini spaghetti. Anyway there is a whole collection of Italian recipes on the website. Just get them here. This recipe makes 2 serving. Get this recipe on myfitnesspal. Rich, decadent and full of good fat. Turn off the heat and pour in the egg mixture and mix through the spaghetti till everything is well coated. Serve with some freshly grated parmesan on top. There IS cream in carbonara. Cream, eggs, cheese, and a salted meat like pancetta or bacon to be be exact!